First of all, big thanks to Woodooz for this Paper Mache recipe, which woke up the crafty girl in me and there is no stopping it now. Beware. This is a dangerously obsessive craft. I chose eco-friendly-NO-plastic-in-any-form concept for my Golu 2013 and that led me to making handmade items. It was very challenging, but learnt a lot in the process, and it pushed me to create a lot of things. 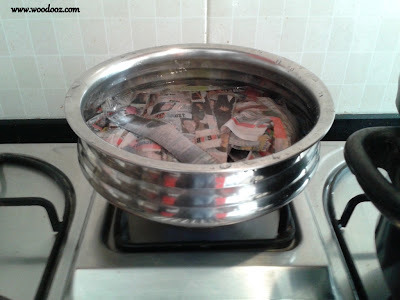 Strain them on a strainer for sometime or squeeze out the water by hand. Once all water is squeezed out, add Fevicol glue. Keep adding the glue in small amounts and keep kneading it till it becomes a dough (it resembles a cookie dough). I also added a little bit of all-purpose flour/ Maida and salt, which added smoothness and I felt they helped in making shapes better than the one without it. When it is wet, insert the required jewelry hooks and allow it to dry. Once dried, you can paint them and apply a coating of Artist's picture Varnish . 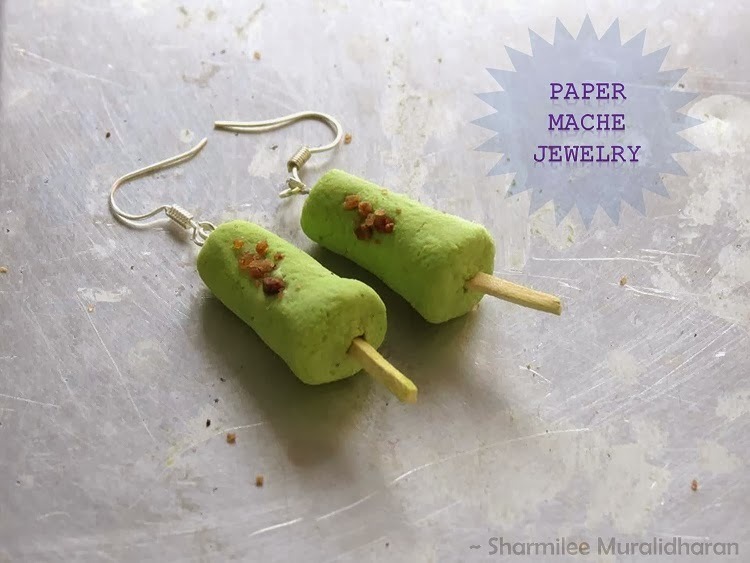 If small pieces or shapes are made, instead of painting after drying, you can add acrylic colours to the pulp when it is wet, like I did for this Kulfi earring and then dry it. Though they can be sanded smooth, what I like the most in these is the unfinished rough look. This is a technique used during our grandma's time to make vessels out of paper mache. I used a Styrofoam bowl as a base. I applied paper mache on the outside of the bowl, covering it completely with the pulp, and allowed to dry for 4-5 days. Since the Styrofoam is flexible, the bowl comes out easily after it dries. And it can be painted as per wish. I used this as a prop for my Golu below a painted coconut shell. 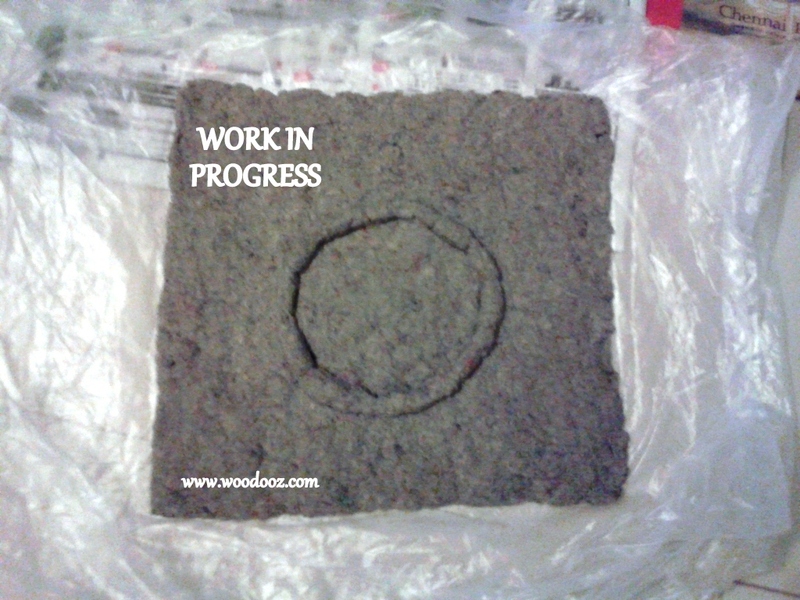 When the paper mache bowl was drying, its colour and texture reminded me of the grinding stones. 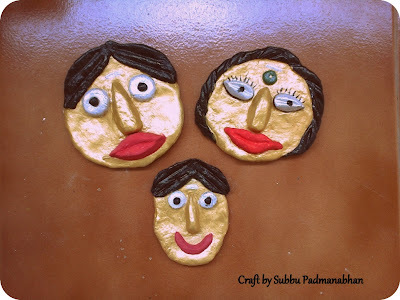 Immediately planned to make these for the Golu. I used a match box as an armature/base for making the Ammi (the flatter grinding stone) and shaped the ends accordingly. For the Aattukal no base was used, just made a ball, and slowly shaped them with hands. All my golu visitors loved them, they all thought these were real miniature grinding stones until they touched and felt them. They are as light as a feather. With the leftover paper clay I made a small doll with a curvy base, so they dance if you push them. No base was used for this. I inserted a thin steel wire as support for the head and the body, though not required. I painted a face both in the front and the back with different expressions and kept them in front of the mirror to click this photo. I made only 2 dolls, but there are 4 girls in total. I call them The Maaya sisters. The picture is self explanatory on how the design was made. As a trial I chose some odd design with a circular shape in the center to keep a Diya. It took few days to dry. I guess lots of rangoli - to be assembled pieces can be made using this, which is as attractive as the kundan rangolis available in stores. 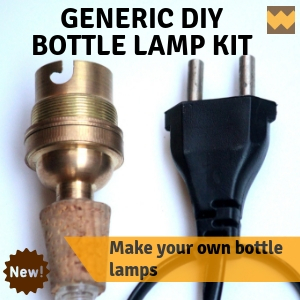 Could be a fun activity for kids to make and assemble them as they wish. Paper mache is such a great medium to work with and can be used to create anything right from miniatures to life size structures. 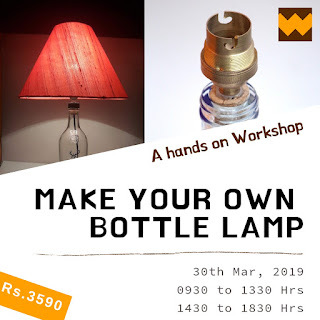 One most important thing is the opportunity for recycling anything lying around at home, newspapers, cardboard, cereal boxes and the list goes on. So, how do you like my paper mache creation ? Please do leave me a comment. Sharmilee Muralidharan is a Chartered Accountant by profession and she works as a Management Consultant in her husband's consulting Company. She is an avid birdwatcher and nature lover. She has deep interests in recycling and eco-friendly concepts. She is from Chennai and is an active member of the ChennaiCrafters club. The truest testament to a DIY tutorial is when someone follows your instructions, improvises and comes out with their own project. When we posted the complete guide to making a paper mache clay, I had few friends write to me about the how to process. 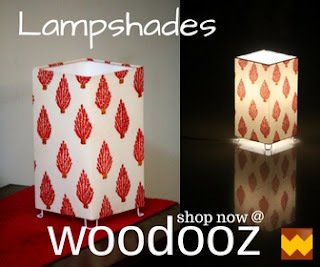 One of them was Uma Pradeep, who is a big follower of Woodooz. She had been telling me how much she wanted to make something out of paper mache, and finally managed to make this idol of Lord Ganesha at the most opportune time. These pictures have come all the way from Edinburgh, Scotland and I shall let Uma tell you more about this project herself. First of all, this is something that was very effective in keeping my kids engaged for as long as we were making this idol. They were keenly looking forward to helping me with ripping the papers off. I did some research after I was done with this, and found that the roughness in the outcome can be avoided if soft tissues are used instead of news papers. It takes time to dry and patience is very key. I also found that it is better if the final product is dried using a hair drier for getting a better density. Small amounts (One spoon) of bleaching powder can be used on the idol after it is done to prevent formation of any moulds. I used a base coat of poster paint and then layered it with three more coats of poster paint. The last coat was made with glossy poster paint. I was only glad that I was able to complete this just in time for Ganesh Chathurthy. 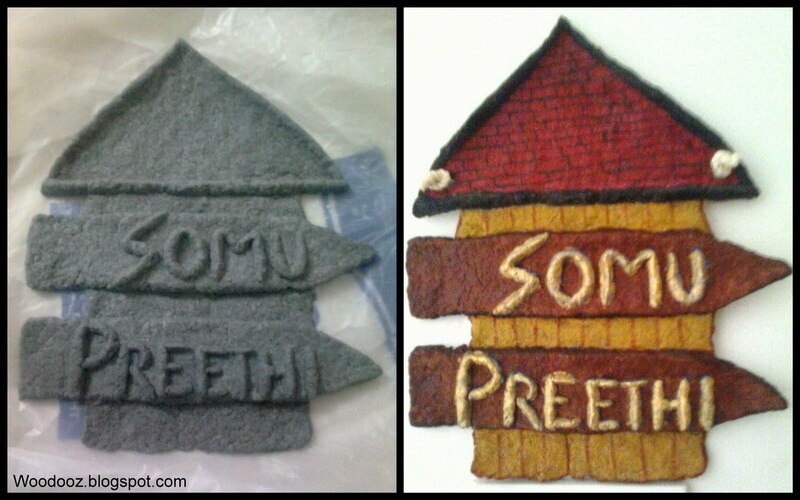 It is indeed quite a fun craft to work on and I intend to make more such stuff in some time. Of course, I also intend to apply my new learnings. Hope you like it. Do leave me a comment and let me know what you think. 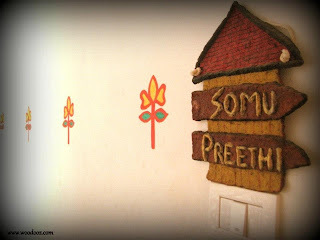 We take a lot of pride in showcasing this post and work of Uma Pradeep. It is not so often that we have someone expressing their thoughts on the utility value of this blog, and this is one of those moments. Hope you loved this post and project just as much as we did. Remember to leave your comments. Also, Do let us know how your Ganesh Chathurthy celebrations went. 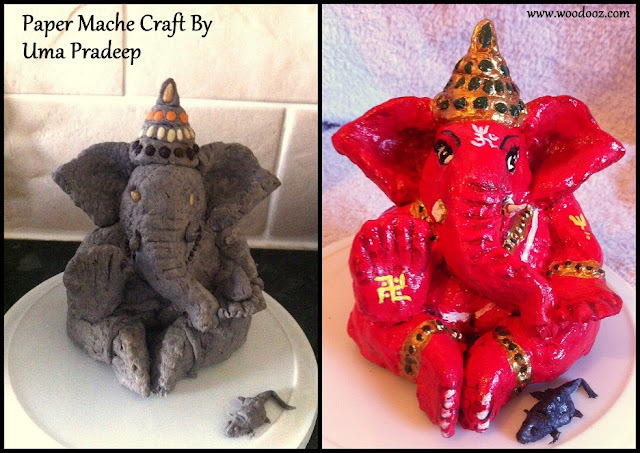 And here is a couple of Lord Ganesh DIY posts that we loved reading in the blog world. Uma Pradeep is a mother to two very active twins and gives vent to her busy schedule through her passion for painting. She is a trained artist in Tanjore painting. She holds a full time job as a delivery manager with Accenture and lives in Edinburgh, Scotland. When I made my first paper mache craft in Woodooz, the process of making the paste was very brief that many found it not so handy. Since then there have been many online and offline requests and so I decided to make a descriptive post on how to make the paper mache clay. 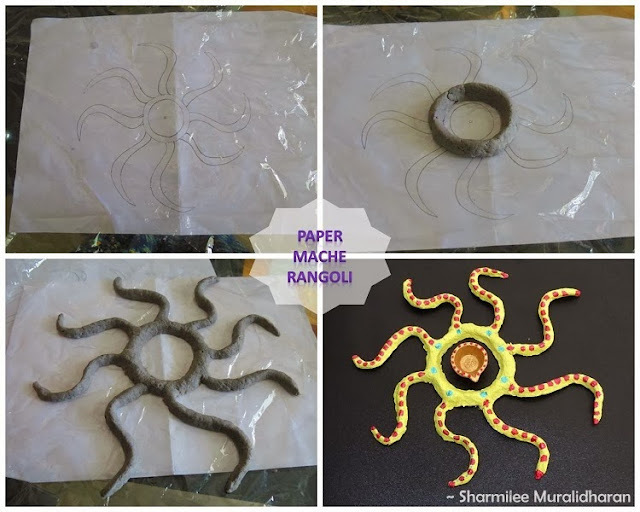 The DIY nameboard and the paper mache tribal masks were made using the very same process described below. Just ensure that you do not disturb your project while it is drying. Once dried, it becomes very strong and stiff. And so, that's how you make the paper mache paste. I have something in mind for this project which I shall save for another day after it is complete. For now, it is just work in progress. Do leave me your comment and let me know if there is anything amiss. Let me know if you used a different method to make this clay. If you do use this tutorial and make your paper mache project, let me know. I would love to know how it turned out. 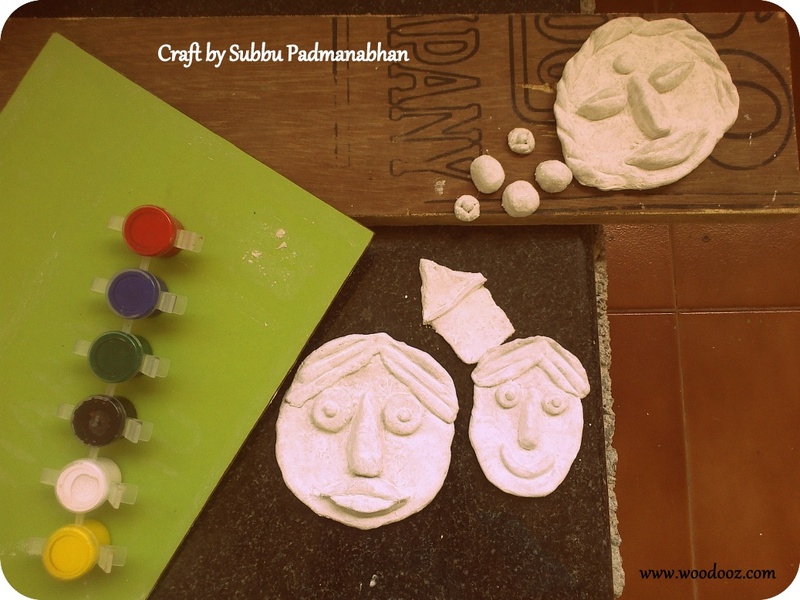 Second in our series of WOODOOZ SHOWCASE, we bring to you a craft project by Subbu Padmanabhan. We once did two tribal face masks and then a personalized name board using paper mache. Here’s a paper mache craft idea that combines the faces and the name plate into one beautiful welcome board for the entrance. 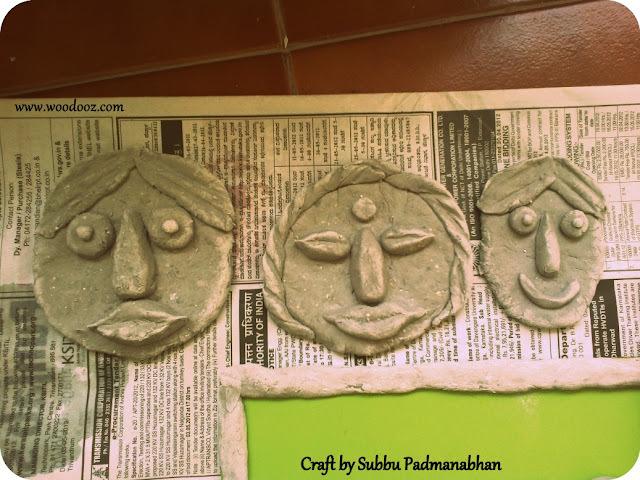 Read more to know what Subbu has to say about her project, in her own words. "I had a spare wooden plank and lots of time during my son’s summer vacation and wanted to use them resourcefully. One of the many things I made was this name board for my home in Bangalore. I wanted to make a home, faces to represent the occupants of the home and then our names. Making the paper mache paste is easy and you can find a detailed step by step description of how Preethi made the paper mache paste here in Woodooz. One additional thing I did was add chalk paste putty when I ran short of flour." "The grey color is because of the water in the mix. Once the figures are made, they need to be allowed to dry for a minimum of 24 hours before you can do anything with it. Once dried, it takes a lighter color with all the water drained off. I made the letters separately and then set it on the plank." "Once I was happy with the arrangement, I set out to color the faces and the letters. I used acrylic colors to give the entire project some life." "You can use acrylic primer as a base coat as it also allows for hiding the pores in the figures." "Once the coloring was done, I used fevicol to stick everything onto the 6mm plywood plank. While you can use wood paint to prime and paint the wood I used acrylic color to give it uniform texture as the faces. I used gold predominantly to go well with the contrasting brown color of the backdrop. After giving the glue time to dry up, the plank was up on my entrance wall." "How do you like it? Do you think something is amiss ? Let me know your thoughts. Leave a comment." By the way, her friends in the apartment loved the name plate so much that one of them wanted to learn how it was made and another wanted to custom make a plate similar to this one. Isn’t that wonderful ? 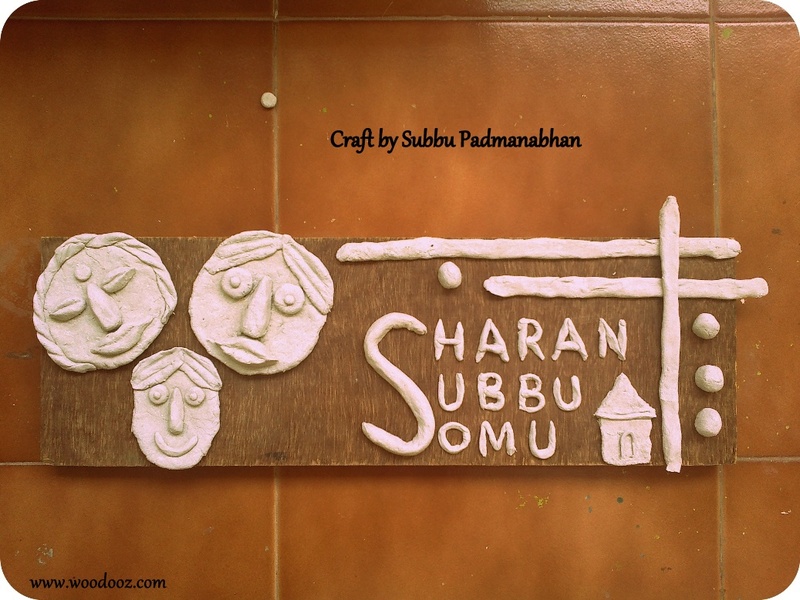 Subbu Padmanabhan is a mom to a 3 something year old boy, and works as faculty in a premier play school. She likes to indulge in mini crafts projects, for the school and her home, during her spare time. The wall art that you see in the backdrop of this bedside lamp is her handiwork too. She lives in Bangalore. 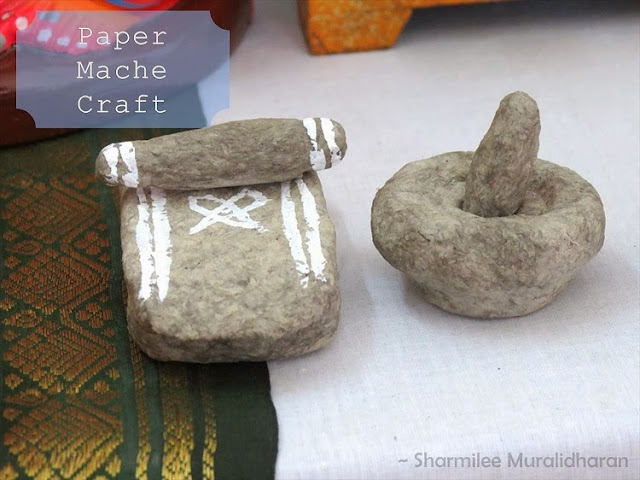 Paper mache traditionally has had many functional uses. 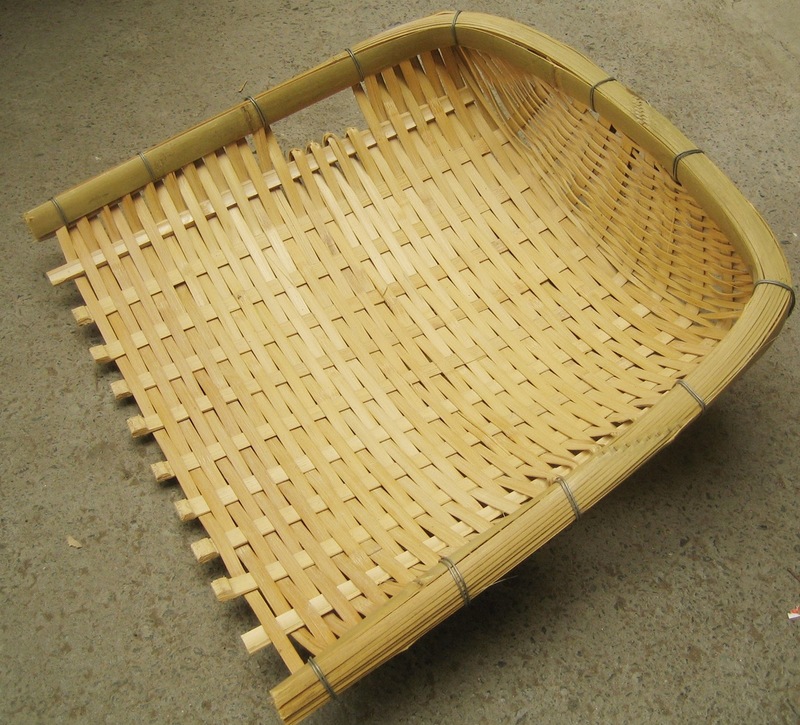 It was used in winnow baskets (Muram in tamil) for giving the cane frame a stronger and smoother finish. I also hear my grand mother used to make paper mache baskets for storing rice. For quite sometime now, it is an extensive medium for various crafts. With merely used paper as the raw material, you can make trays, pen / magazine holders, lamp shades, earrings, beverage coasters, toys, decorative items and much more if you unleash your imagination. The craft is not limited to only the smaller objects. We used to make 30 feet structures in our arts and decoration club in college. 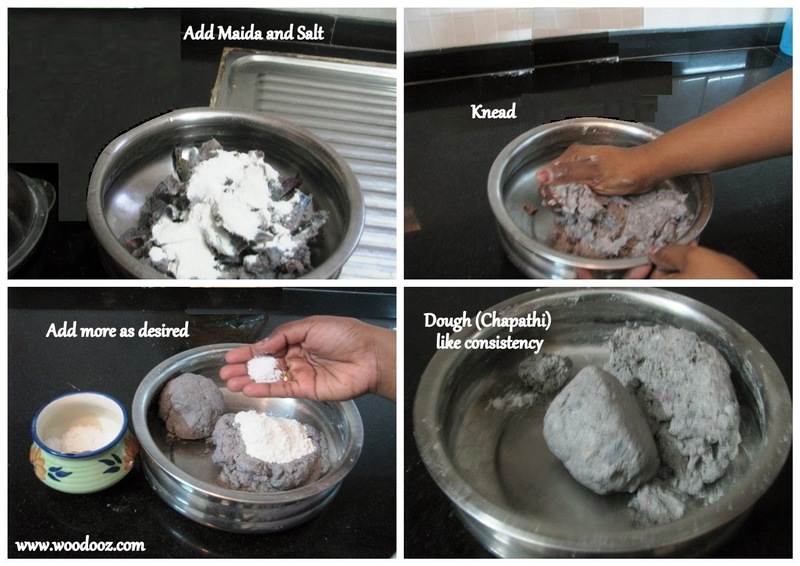 While making the paper mache mix warrants a separate, detailed post by itself, you can find a brief overview of how to make the paper mache mix from an earlier post of ours. 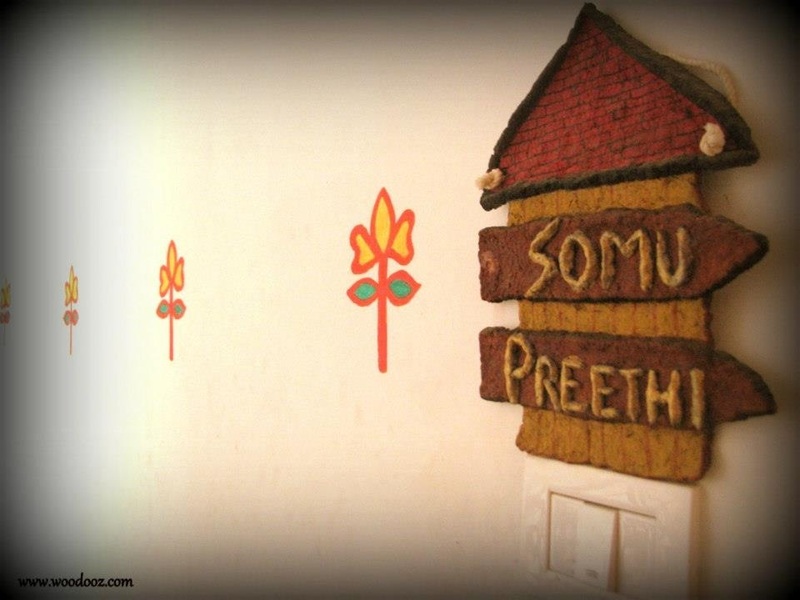 For this name board, the shape of the house was first made and then the letters, which were stuck to the backdrop. Paper and maida being the only base, you would be surprised at the strength the whole mix attains after drying, which takes about 2 days. You can use putty (Chalk powder) for a smoother finish, paint with your desired colours / design and give a coat of modpodge for protection. On the whole, a very lovely craft. This DIY is a decorative project - Making indian tribal faces using paper mache. Thanks to my art club in college and Google. I had a fair idea of the steps involved in making the paper mache clay. 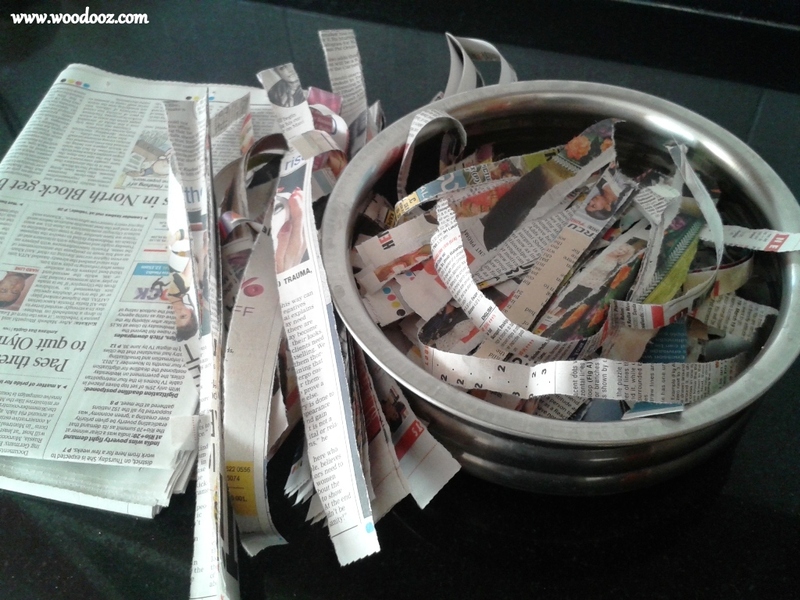 One will need paper strips (I used old newspapers), flour (Maida), salt, water, paint (according to your choice). The first step involves soaking the paper strips in water over night. Alternately, you could boil them to fasten the process. Drain the water, grind it, and slowly mix flour and salt. It takes atleast an hour to get the consistency. Mix as much flour as required and knead it till it resembles clay. Our balcony garden is getting set and we wanted little things to fill it up. So I decided to make a couple of tribal face masks using the mixture. I couldn’t wait till it dried up to give the final touches. It had to be left for close to 24 hrs to completely dry up. The result was a beautiful tribal couple.